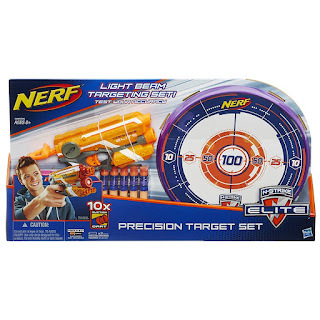 Head over to get this Nerf N-Strike Elite Precision Target Set for ONLY $12.99 (Retail $29.99)! Test your accuracy with the Precision Target Set! The set includes everything you need for target practice: a Firestrike blaster, a target and 10 Suction Darts in 2 different colors. Just stand up the target or hang it from a door and take aim with the light beam when it's your turn. Your Suction Darts stick to the target, so you can see your accuracy improve! Sharpen your dart-blasting skills alone or take on a friend in a suction-dart showdown. Either way, you'll become a sharpshooter with the Precision Target Set! Nerf and all related characters are trademarks of Hasbro.